Everything changes for Victoria in a transformative episode that serves as an emotional departure to one (or possibly two) of the show’s beloved characters. Curiously, Episode 3 begins by addressing one of our biggest criticisms from last week. The woefully unresolved ‘palace thief’ subplot is placed front and centre in the opening scene, finally having some degree of consequence on the rest of the cast. Yet while this specific thread fizzles out as quickly as it’s reintroduced, it prompts Albert to reform the way the palace is run. Again, it’s a minor subplot thinly spread throughout the hour, only really returned to in the closing scenes. But it’s symbolic of things to come, offering the closest look of life outside the palace we’ve seen in Series 2 so far. It may only get a small amount of screen time in the episode, but the influence and presence of the poor looms over proceedings like an ominous shadow. Let’s also quickly cover the ongoing arcs for the supporting characters, which we see a little more of this week. Lady Skerett is out and about once again, walking the streets of working class London. Diana Rigg’s Duchess is as acid-tongued as ever, at least until Victoria (sassily) puts her in her place. The lion’s share of development though goes to Ernest and Wilhelmina. The will-they-won’t-they nature of their relationship reaches a new peak – only to be thrown into question again when Harriet Sutherland returns on the scene. Ernest, dressed as Robin Hood, finds himself in a bit of love triangle. His heart clearly still belongs to Harriet. However, she reminds him they can never be, and he accepts his “outlaw days are over”. He heads back to Coburg and bids Wilhelmina goodbye. She misses her chance to say anything back, and shyness claims another victim of a broken heart. There’s a lot of aggro on the horizon though… and it’s all caused by the future of silk! The episode’s title, Warp and Weft, is unfortunately not the name of a Nineteenth Century superhero duo. Rather, it alludes to this week’s central conceit: British silk weavers (and by extension, British workers) are at risk from cheap foreign imports. Victoria’s answer to this problem is to throw an extravagant ball, with everyone in fancy dress made from Spittlefields silk to reignite interest in the business. Her heart is in the right place, but her logic is flawed. Albert and Robert Peel try to change her mind, to no avail. The ball goes ahead as planned. Admittedly, it looks incredible – a real excuse for the costume and design department to go all out. Everyone, and everything, looks absolutely divine. The music, the dancing, and the jovial atmosphere are pitched to perfection. But, alas, there cannot be light without dark. As the upper classes waltz away inside, the lower classes are rioting at the palace gates. At one point of the evening, Victoria walks past a window and sees the uproar outside. She stands, watching and breathing heavily with guilt and disbelief. The music from the ballroom and the madness from below crescendo together in a flash-like frenzy. The effective moments don’t end there, either. As Victoria is being dressed in her fancy dress outfit, she is juxtaposed against the arguing of the masses. Parliament is up in arms, and their unrest only swells as the lead up to the party begins. The editing and direction this week is simply sublime, and when the episode hits its heights, the moments are very memorable indeed. “No good deed goes unpunished” quotes the Duchess, and for Victoria, that couldn’t ring more true. The Queen has made a well-intended mistake – and boy, does she pay for it. She receives scathing criticism in the press, but that proves to be the least of her worries. Hinted at last week, and now thrust into the spotlight, is the declining health of Lord Melbourne. 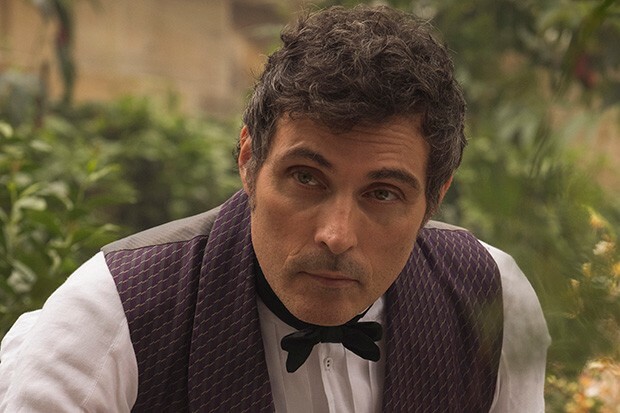 Rufus Sewell pulls at our heartstrings as he looks and acts increasingly unwell. True to himself, Lord M stoically presses on and does not wish to burden Victoria with his ailments. She eventually finds out through Albert and pays him an emotionally charged final visit. Their farewell is unspoken, as their relationship has always been. Coleman and Sewell break our hearts all over again in a understated and powerful scene. Things, it seemed, couldn’t possibly get any worse for the distraught Victoria. Oh, how wrong we were. In hindsight, the foreshadowing of Dash’s death is not very subtle at all. While never a major character, he’s suspiciously more present than ever this week. Couple that with Victoria observing his dry nose and unwillingness to play, and it’s clear that something was coming. To the episode’s credit, it seems to realise that. We do not see Dash when Victoria first walks into the room and discovers his fate – but we instantly know what has happened. For all the drama surrounding Lord M’s illness, it’s this that cuts our emotional core. In a way, this is infinitely worse. We, and Victoria, have been so preoccupied with Lord M’s departure that the sheer suddenness of this is just too much to bear. Anyone who has ever lost a pet will feel Victoria’s heart shatter as she breaks down into pieces. In the closing moments, the Queen buries Dash in the palace gardens. She reads aloud his epitaph: “If you would be beloved and die regretted, profit by the example of Dash”. His role was only a small part, but he will be terribly missed – not just by Victoria, but by all of us as well. Lord M’s fate is left (intentionally?) ambiguous, but Dash’s passing is one sadness that we simply cannot escape from. The episode ends with Lord Melbourne, sat alone, listening to the clockwork birdcage given to him earlier by Victoria. The music stops – but our tears do not. Victoria Series 2 continues next Sunday, 17th September on ITV.